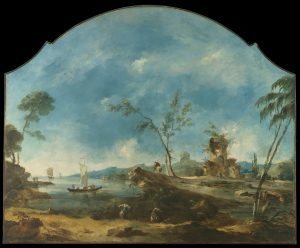 Francesco Guardi, Fantastic Landscape (c. 1765), from Wikimedia Commons. This is me at twelve years old, running for all I’m worth up Classon Avenue, bookbag under one arm, with Kevin Lester and three other bullies in close pursuit. They’re mostly bigger than me, and the only reason they haven’t caught me yet is because I had a half-block head start from the Nativity School gate. Read the Full Story at The Piltdown Review. Of all the tools father uses to make me, the chisel is the cruelest. Long after he has had his Ciró and retired for the evening, I lie on my bed of shavings, my half-formed body criss-crossed with burning gouges. In the small hours I finally drift into a kind of stupor, my head full of the scent of resin that seeps from the cuts. Read the Full Story at Bewildering Stories.